It all started a week ago Saturday. The family was in Hollywood on the way home from Amoeba. We had bought a few cds, a couple of posters and a magazine and were just going to take our time in Guitar Center, pick up some guitar pics and head home. Once we got in I headed to the upstairs area with the drums and Darian and Jacki remained downstairs with the guitars. After playing the electronic kits for about 30 minutes I headed back down to check on Darian and Jacki. By this point Darian had fallen in love with an Ebony Gibson Les Paul Studio. It looked great, it sounded great, and Darian (along with the sales guy) were determined to make her the proud new owner of this guitar. Usually I can point at the price, or distract her with other guitars and she'll let whatever she is playing go. But this time it was different. This guitar was used, and was several hundred dollars cheaper than a comparable Les Paul. Although the guitar was used it looked brand new, and sounded better than some of the other Les Paul's Darian tried out that day that were new. Instead of making any decisions we asked Guitar Center to hold the guitar till Monday and then we'll give them an answer on if we will get it or not. Once we got home I told Darian she must trade in one of her other guitars, use it as collateral to hold the guitar, and then sell her guitar to Guitar Center in order to bring the cost of the Les Paul down. I wasn't positive she would go through with it and wanted to see how serious she was about getting this new guitar. 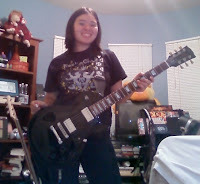 I ended up working late Monday so Jacki took Darian and her Billy Martin PRS SE guitar to Guitar Center. Darian was not happy, but knew this was a sacrifice she would be forced to make if she was going to get the Les Paul. Of course I can't keep from spoiling Darian so although I was making her go through the motions of giving up the guitar I had no intention of letting her old guitar get away. I think of it as a growing experience, and one she won't ever forget. Thursday was the day we agreed Darian could get the guitar. Once again Jacki took Darian and they picked up the new Les Paul. Once they picked up some strings, a case and paid for everything the Guitar Center guy brought back out the PRS. Darian said, you are going to make me say goodbye to it again! And at that point, Darian realized she was going to be able to take that guitar back home too. 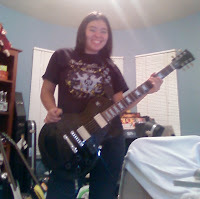 I got home late Thursday evening and snapped these pictures of Darian with her new guitar. Jamming away and happy as can be.